"The story of that man and his 76 trombones, and the wonderful, wonderful tune he played on every heart in town!" 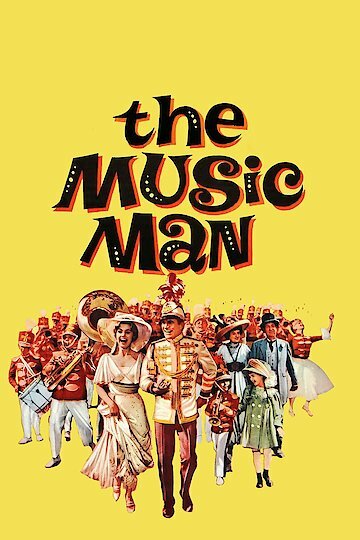 The Music Man is the film adaptation of a Broadway musical written by Meredith Willson. The movie stars Robert Preston as professor Harold Hill and Shirley Jones as Marian Paroo. The film is approximately two hours long and contains all the musical numbers from the stage show. The show starts on a train with a group of traveling salesman discussing how tough it is to make a sale. One of the men complains of a man selling boys' bands creating a bad name for the business. As the train pulls into the station in Iowa, the band salesman exits the train and makes his way through town. Calling himself Professor Harold Hill, he meets an old friend. His friend suggests that the only trouble he could have in town is from the single librarian, Marian Paroo, who is also the piano teacher. Hill works on the librarian, telling her that he is in love with her. He then convinces the townsfolk that if the boys don't have an activity like a band to belong to, they will get into trouble hanging around the local pool hall. After taking deposits from the boys' parents for instruments and band uniforms, he sticks around town until the Wells Fargo wagon delivers the merchandise. Marian, knowing Hill isn't really a band teacher, starts to like him when he gets her little brother Winthrop to talk for the first time since their father's death. Once the money is collected for the merchandise, another traveling salesman informs the mayor of Hill's scam. Having fallen in love with Marian, Hill is unable to leave town. Carried off to be tarred and feathered by the townspeople, the boys show up in their uniforms and instruments. Under Hill's guidance, the children start to play, and the townsfolk release Hill. He finally stays and completes his dream of creating a boys' band. The Music Man is currently available to watch and stream, buy on demand at Amazon, Vudu, FandangoNow, iTunes, YouTube VOD online.